Published Jun 3, 2015 by Prentice Hall. 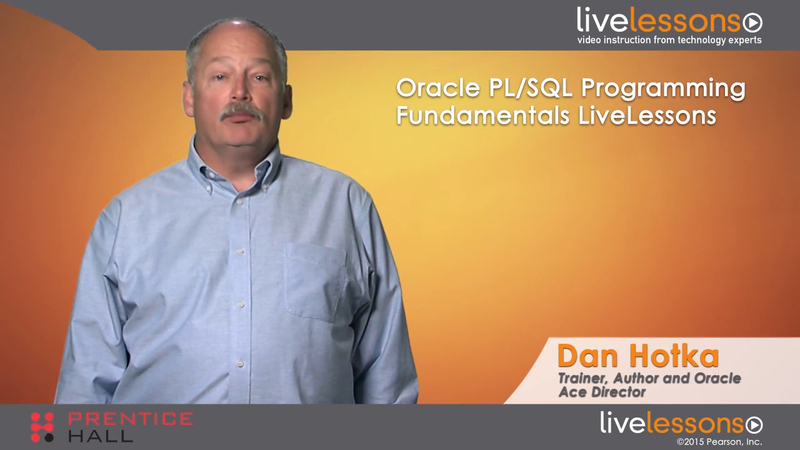 Oracle PL/SQL Programming Fundamentals LiveLessons covers the basics of Oracle's language extension for SQL and the Oracle relational database. The focus is to give students with a working knowledge of SQL the ability to develop Oracle procedures, functions, and packages using the PL/SQL language. In this LiveLessons course, Oracle ACE Director Dan Hotka will teach you how to work with existing code and create new programs. Along the way, you will learn both conditional and looping syntax and techniques, error handling and error processing, plus how to work with script files, procedures, functions and packages (a collection of procedures and functions). This hands-on course also covers how to use the PL/SQL debugger and the PL/SQL profiler and how to apply PL/SQL performance tips. Dan Hotka is a training specialist and an Oracle ACE director who has more than 37 years in the computer industry and more than 31 years of experience with Oracle products. His experience with the Oracle RDBMS dates back to the Oracle V4.0 days. Dan enjoys sharing his knowledge of the Oracle RDBMS. Dan is well published with 12 Oracle books and well over 200 published articles. He is also the video author for Oracle SQL Performance Tuning for Developers LiveLessons. He is frequently published in Oracle trade journals, regularly blogs, and speaks at Oracle conferences and user groups around the world. Visit his website at www.DanHotka.com. Lesson 1: PL/SQL Course Overview covers the course pre-requisites, database objects, and the tools that are used throughout these lessons. Lesson 2: Oracle PL/SQL Overview reviews the Oracle RDBMS architecture from a PL/SQL tuning point of view. This information is referenced throughout the course. The lesson then introduces the major components of the PL/SQL programming environment. Lesson 3: PL/SQL Basics and Variables covers the basics of PL/SQL and provides a working knowledge of PL/SQL variables. Lesson 4: Logic Flow covers flow control and PL/SQL starting with IF/THEN/ELSE logic and the useful CASE statement. Then, it introduces the attendee to the Looping logic. Lesson 5: PL/SQL Cursors introduces you to PL/SQL cursor management. It covers implicit cursors and explores explicit cursors. Lesson 6: PL/SQL Exception Handling begins with an introduction to PL/SQL exception handling. It covers the basic exception clause syntax, then covers implicit and explicit error handling. Next, it shows useful techniques such as using SQLCODE and SQLERRM. The lesson ends with the coverage on User named and application exceptions. Lesson 7: PL/SQL Procedures and Functions begins with an introduction to named blocks or PL/SQL procedures and functions. It explores the PL/SQL procedure basic syntax and examines the PL/SQL function basic syntax. The remainder of the lessons illustrates useful examples and parameter passing. Lesson 8: PL/SQL Packages begins with an introduction to PL/SQL packages. It then covers the syntax and executing code in packages. Lesson 9: PL/SQL Triggers first introduces PL/SQL Triggers, then explores the syntax for these triggers. Next, it covers the restrictions and order of processing and concludes with useful examples and tips. Lesson 10: PL/SQL New Features covers some of the useful PL/SQL new features introduced over the years. Lesson 11: PL/SQL Collections explores PL/SQL collections, or array processing. It introduces what a collection is and the three types that PL/SQL supports, explores the syntax of the three collection types, and shows code examples for each. The last section is the gas pedal for collections: bulk binding. This syntax allows for collections to be rapidly populated from Oracle database tables. Lesson 12: PL/SQL Debugger, PL/SQL Profiler, PL/SQL Tuning Tips completes the PL/SQL story with an introduction of the PL/SQL debugger, PL/SQL profiler, and a lecture on PL/SQL tuning tips. Next it covers both the TOAD and the SQL developer debuggers including a live demonstration of both debuggers. Then it details the PL/SQL profiler and provides live demonstrations of both the Toad PL/SQL profiler and a character-mode PL/SQL profiler using SQL*Plus. The lesson concludes with some useful PL/SQL coding tips.